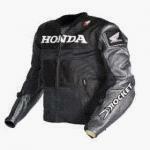 Joe Rocket is one of the most popular apparel brands in the street bike industry. 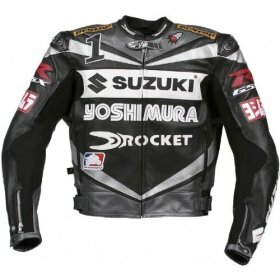 They’ve successfully struck licensing deals with Kawasaki, Suzuki, and Honda to bring co-branded Joe Rocket jackets and other apparel to the market. While they’re probably best known for their jackets, Joe Rocket also makes gloves, helmets, boots, and leather suits, as well as casual apparel such as t-shirts and hats. Joe Rocket leather jackets strike a unique balance of cost, style, materials, and protection. 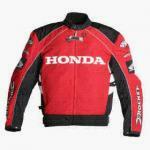 The cost tends to be on the high end for most motorcycle jackets. Want to spend $500 on a jacket? You can find a Joe Rocket that costs that much! Of course, many will argue that you get what you pay for, and with Joe that’s no exception. The materials are typically of the high-end variety, designed to protect and to be quite durable. The styling is certainly open to taste, but most would say that they provide a distinctive, unique, and classy look. As far as protection goes, most jackets come equipped with the European Union’s CE seal of approval for their reinforced padding and the option to add more padding as well. The downside of this, of course, is that Joe Rocket jackets can be a bit stiffer than many other brands and take a bit of getting used to. Some folks like to show off the armor they're wearing as a way of saying, "Yes, I do dangerous things." If you're proud of the fact that you need molded thermoplastic rubber shoulders and elbows, then show them off with Joe Rocket's RASP textile jacket. 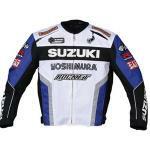 This officially licensed street wear from Yamaha has "sassy" written all over it! Ok, not literally. Actually it has "Rocket" written all over it, over the arms and on a cute lower back logo. Combine the cachet of Honda Goldwing with the hipness of Joe Rocket and what do you get? Joe Goldwing? OK, dumb question. What you get is this jacket! 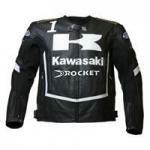 This Kawasaki jacket from Joe Rocket is made of genuine lightweight (1.2mm to 1.4mm) cowhide leather. It's an officially licensed product from Kawasaki, not a knock-off, and comes with the quality that is Joe Rocket. This is quite a versatile jacket. 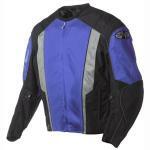 Start with the climate control -- it's got zippered vents on the sleeves and the back for maximum airflow. Additionally, it comes with a removable insulated liner for the vest area. This makes it a "three season" jacket, appropriate for all but the coldest weather. This is a lightweight (1.4mm) genuine cowhide leather jacket made by Joe Rocket. The Honda name and logo has been officially licensed, so you know it's genuine.